takes place in Canberra this coming long weekend featuring the Ferrari slaying electric Tesla from the USA. Like a music festival, Australia’s first national electric vehicle festival delivers one main act – the Ferrari slaying Tesla Roadster – and is supported by plenty of interesting, solid support acts, such as: the 1917 vintage Detroit Electric; incredible electric motorbikes (like Vectrix, who will soon be selling bikes in Canberra); conversions of petrol powered cars; as well as the infrastructure needed for an electric vehicle world. It will be a great gig. The main attraction for the festival will undoubtedly be the incredible Tesla Roadster that can sprint from 0 to 100km/h in just 3.9 seconds. That is Ferrari beating acceleration, from a car that has maximum torque at 0 km/h. There is only one Tesla in Australia and its biggest public appearance will be at the festival; on the lawns in front of Old Parliament House on Sunday 4 October, from 9am to 4pm. “The Tesla is the first guilt-free high-performance sports car of our time. There is little else to say, it’s a dream. It pushes your stomach into the back of the seat with renewable energy, giving you a guilt-free adrenalin hit. I want to see them on our roads,” said Ivan Slavich, Chairman of the ACT Electric Vehicle Council and executive at ActewAGL, the ACT’s energy and water utility. Electric vehicles have been in the margin of the automotive industry since cars arrived on history’s pages. Until now. Many enthusiasts have undertaken incredible conversions and there are now viable conversion businesses operating in Australia, who will also be at the festival. “Electric vehicles are finally coming of age. Conceptually, they have always been smarter than internal combustion technology, but their stars have not been aligned until now. It seems we are finally at a turning point. The technology is viable, the capital is now willing, and the market’s appetite, driven by climate change adaptation, is at last ready for better vehicles,” said Julia McDonald, engineer and member of the ACT Electric Vehicle Council. Special note: In advance of the Festival, on Thursday morning, 1 October, a track comparison is being planned between the Telsa and an equally impressive, Audi R8 on the Hill-climb track at Sutton Road, between the Canberra Airport and Queanbeyan. Stay tuned for more details. Tuesday, September 22, 2009, Sydney – Mahindra Automotive Australia (MAA) has unveiled its first TVC campaign since the Mahindra Pik-Up utility vehicle was launched in Australia. The ad’s content and tag line “Made for the hardest places on Earth” demonstrates the vehicle’s proven capability under some of the harshest conditions in the world, including its origin India, where the vehicle is manufactured by automotive giant Mahindra & Mahindra. Claire Tynan, CEO, MAA said, “To date we have focussed on a mix of below-the-line, targeted print advertising, radio, web and sponsorship activities to ensure that we communicate with our key audience of farmers and tradies. After building the brand over the past two years we wanted to achieve a wider reach which TV delivers effectively in addition to these mediums. The ad sees the Mahindra Pik-Up ‘journey’ around the world from the Pyrenees to the Sahara, Wadi Rum Desert to the Himalayas, and back to the Serengeti, where the Mahindra is used by many local drivers. ‘Hardest places’ is not only relegated to foreign locations; the ad demonstrates that the vehicle can also be found at comfortably at work in a mine, at a vineyard or on a worksite. The TVC, was produced by Sydney agency Synchromesh Marketing in North Sydney. In a recent true-to-life example of the Pik-Up’s triumph under harsh conditions, Brazilian motoring enthusiast Ricardo Augusto de Souza Campos, better known in the South American motor sport fraternity simply as Rasc, took third place in the production category of the tough Rally dos Sertoes in Brazil, in his Mahindra. The Rally dos Sertoes is one of the toughest events in the world, second it’s said after the mighty Dakar, and this year it was run over 11 days, was 5,045 km long with featured events that totaled 2,605km of competitive stages between Goiania and Natal. 128 vehicles participated; among them were 66 cars and seven trucks, with the rest being motorcycles and quads. Rasc wanted to do something different with his 16-year old son RASC Campos, better known as Rasquinho, and so he purchased a Mahindra pick-up. A veteran of over 25 years of motor sport in Brazil, Rasc has seen action not just in circuit racing (where he was Brazilian champion in the Speed 1600 series) but since 1990 had turned his hand to rallies, taking part in the tough Brazilian events in all forms of machinery, latterly trucks. In this demanding event run across Brazilian jungles and swampy terrain, his placing of 22 overall and third in the production category was a true motoring success story and a testament to the Mahindra’s survival in one of the “Hardest places on Earth”. Can a lightweight, soft-roader cut it outback? The All Torque team saddled up three little Land Rover Freelander 2s and disappeared into the middle of Queensland. We surprised ourselves. You might too. Away from the city, past even the furthest outer suburbs is 4WD land. For over 90 per cent of off-road owners, it is a mystical place full of tall tales and legend, where men can be boys and boys can be men. In the yard of the Land Rover dealer in Brisbane’s busy Fortitude Valley, we unfurled the Drive Queensland tourist map and plotted our course taking us past the iconic outback town of Longreach and into the vast unbroken paddocks along the dingo fence and marked with tantalising red warnings like, “drivers do so at their own risk” and “travellers should advise police of their intentions”. Excellent! Armed with a keen sense of adventure, spare tyres and extra water, we set off in three brand new compact Land Rover Freelander 2s to test the comfy little 4WD’s ability to match our enthusiasm. The new $50k Freelander has the latest confidence-enhancing electronic driver aids, seven airbags, fulltime 4WD and a fuel economy that won’t break the bank, especially the thrifty little turbo diesel. The smart 6-speed automatic transmission which the Land Rover hype department calls CommandShift™, does manual sequential gear changes with a driver-selectable sports mode. It comes standard across the range. Cool. By the end of a long day at the wheel, we were outback, reminded by the necessity to stay vigilant in the failing light for marsupials with appalling road sense, several of whom barely escaped conversion to crow food. The next day was a whole new world, waking to choruses of crows and magpies in the crisp country air of Charleville. We headed out through rough cattle country leaving satisfying trails of dust, stopping occasionally to open (and close!) gates and pulling up for Cornettos at godforsaken little stores that often required going in search of the owner to complete the transaction. My favourite line, “Do you take Amex?” always got a hearty laugh. This is the outback! 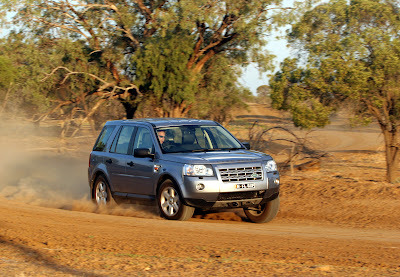 In the 2000-something kilometres we travelled, the little showroom-standard Freelander 2s performed flawlessly. There was the mandatory flooded creek crossing, sand dune bogging, rocky hillclimb and even a bit of wild horse mustering. We weathered countless jibes aimed at our lurid, metallic painted soft-roaders from crusty locals at the many dusty saloons along the way. Clearly the venerable Land Rover had slipped in their estimation in recent years, but that didn’t stop them from coming out for a butcher’s at the little runabouts. So ended our little Leyland Brothers remake (yes, they used Land Rovers once) and we handed back our trusty, mud-splattered mounts with all the hair-shirted satisfaction of knowing we went where no mere sedan could possibly follow.